Wild camping can be a great way to enhance the adventure, solitude and self-sustainability of a multi-day hike. Yet, for many, it inflicts a bout of apprehension difficult to rid; an understandable sentiment, but one most certainly worth overcoming. Permission to camp: Of course, if you can ask the land owner (if indeed there is one), then do so; it will make you feel better and is, in the eye of the law, the right thing to do. More often than not, the landowner will comply. In fact, in my experience they are often excited that you chose their land over their neighbours! Whilst in France, the owner of a vineyard was so delighted to have my brother and I stay, that he let us wash in the horses drinking trough, free of charge. How lovely. Pitching: Soft, flat ground is favourable. However, if hard to come by, use spare clothes and gear to fill in holes and to counteract angled slopes. Food: Without a nearby shop, be sure to have enough food to get you through the night and on to the next town. If foraging for berries, mushrooms and leaves, be sure to know your stuff. I once ate Lily of the Valley by accident and the repercussions were, by all means, disagreeable. Water: Again, ensure that you have enough liquid for the night. If using river water, be sure that the flow is running with vigour and is above the livestock line. Consider using purification tablets. Fires: Only have fires if necessary (for cooking and for warmth). Yes, they may be paramount for the quintessential wild camping photo shoot, but they leave a mark. Extinguish thoroughly. Tip: campfire smoke can be a great way to add fragrance to a particularly odorous pair of socks! Sleeping: The sounds of the forest can be blissful, but they can also have you thinking that a foraging mouse is an angry hunter with a gun. I often wear earplugs to get me to sleep and shed them at some point in the night, allowing me to wake with the dawn chorus. Leaving camp: Aside from a flattening of leaves, twigs and shoots, you should leave a camping area as you found it. But, most importantly, do not forget the essence of wild camping – your connection with the land, your freedom and your solitude – that makes the experience so special. Great post! Wild camping is the best! The photos are beautiful, looks like you’ve been to some amazing places. Thank you Anna B. I will be following you on your journey to, and along, the AT. It’s always interesting to see how others prepare for long distance trails. Good luck with the training! Thank you so much! I love the blogging world for the connections we make and seeing the world through someone else’s eyes. I’ll be sure to keep up with the posts. Happy trails! Sentiments great but your advice on camp fires could be mis-read. Please only have fires if you can do so without leaving any trace such as burnt grass, fire stone rings etc. This is not very often. Thus, you should carry other means of cooking and staying warm. Hi Rob! I know, the Mercantour is a quite beautiful area. My brother and I hiked the GR5, so we bisected through the heart of the park and down into Menton, camping along the way (the photograph with all of the flowers above is on the northern fringes of the park). How about you? What were you experiences like there? Nice! I was hiking near the Col De La Bonette in August last year, and near Isola along the Italian border. The Mollières valley is really pretty and I’d love to hike in the Vallée des Merveilles at some point. You have passed through quite a bit of that region, that’s great. As always, there is plenty more to explore. The Vallée des Merveilles is quite something – wild and rugged, with heaps of enormous, crumbled rock all over the place. I couldn’t recommend it enough. When I was younger, we did a lot of backpacking in the wild in the Eastern U.S. We only took short trips, then returned home. Once, the forest we were in was on fire and we were lucky to get out thanks to a fire road. Other campers had left a site and failed to extinguish their fire properly. All of your tips are excellent. We never thought to ask people if we could stay on their land. We usually chose the wilderness. Wow, Robin, it sounds like you had a lucky escape. If nothing else, I guess you learnt a valuable lesson about camp fires. Have a lovely weekend Robin! We were lucky to escape. We saw the fire; immediately put out our fire, which was properly built, and made it to the fire road. The fire hadn’t jumped the road or we could have been trapped. We made it to our car, drove to a store and called the fire department (this was before cell phones). These days, I am less likely to camp in the wilderness. The weekend has been good so far. Took a little blogging break. Hope your weekend is a nice one! 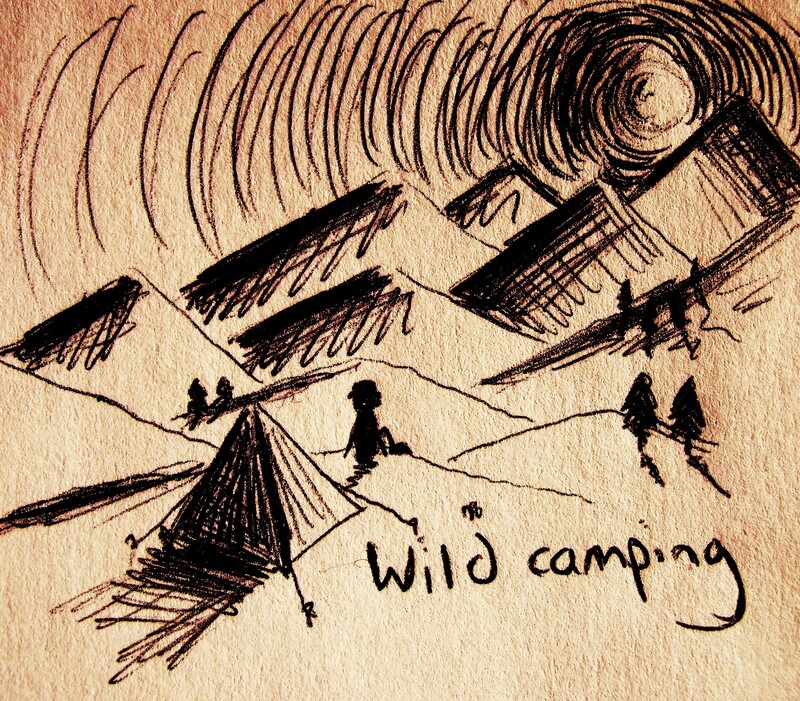 I really want to go wild camping im Scotland!